What is Cloud Enterprise Architecture? Cloud computing can be defined as the process of delivering storage and computing capacity as a type of service to a heterogeneous group of end-users. The name of this process was taken from the constant use of clouds as a means of abstracting the system diagrams contained in complex infrastructure. The entire process delegate its services with the help of a user’s data, computation and software used over a network. Cloud Enterprise Architecture on other hand monitors enterprise architecture with regards to usage cloud computing environment. This is an investigation process of convergence the architectural blocks with different kinds of desired transformation. The idea of good enterprise architecture leads towards effective adoption of service oriented architectural framework. Overall idea of Cloud Enterprise Architecture revolves around addressing the magnitude of rate of change and increase in complexity. If a Cloud Enterprise Architecture is defined properly then it provides the ease to perform tasks easily in cloud based environment with rapidly changing needs of performing the tasks efficiently and effectively. It is also useful in detecting what the IT environment specifically needs while also increasing its capacity or adding more capabilities without having to invest in new infrastructure, license new software and train new staff. It would be difficult for you to successfully carry out the Cloud based Enterprise Architecture process if your knowledge about it is limited. 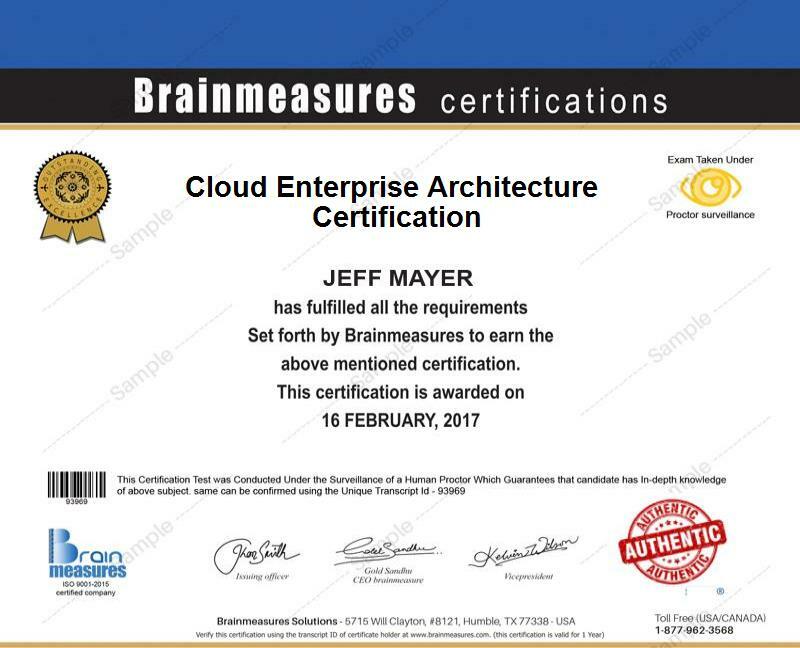 This is the main reason why you should take part in the Cloud Enterprise Architecture Certification Program which is offered by Brainmeasures. It is highly recommended for you to check out this legitimate online certification company. What makes the Cloud Enterprise Architecture certification program from Brainmeasures useful for anyone who desires to learn more about the process is that each of its topics are explained in a detailed manner. The company also offers resources that are guaranteed to provide the best information about the field. It should also be noted that getting your cloud computing certificate through Brainmeasures requires you to undergo a well-developed and detailed skill testing process. This is not just the end overall your knowledge and skills will also be judged through an online exam and some scenario based assignment. A dramatic increase in the level of your salary is also greatly possible after you successfully complete the Cloud Enterprise Architecture certification course. You can easily get the key positions in the field of IT, Database Management, Computer Science and Information System or ERP with the help of your Cloud Enterprise Architecture certification. An average salary of $105,000 is expected per annum for holder of Cloud Enterprise Architecture certification from prestigious online certification providers which is Brainmeasures. You can also work for IT or security management jobs which is an important assistance in receiving salary or income around $120,000 to $150,000 per year. The Cloud Enterprise Architecture certification program which is now accessible at Brainmeasures is guaranteed to offer numerous benefits to a wide range of individuals and professionals especially those who are part of the IT and computing industry. This certification course works more suitably for business managers, channel managers, IT professionals, business analysts, business development heads, telecommunications managers, cloud storage analysts, cloud services managers, cloud services receivers, systems and network integrators, data center or database managers, network administrators and any other individuals and professionals who dream of fully understanding everything about Cloud Enterprise Architecture.